Trend of technology TORUSMILL® TM. 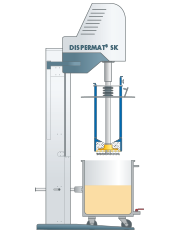 Highly efficient combination of dissolver and basket mill.The TORUSMILL® TM is a patented dispersion system which allows for a particularly economic and environmental dispersion of high quality products. With the TORUSMILL® a predispersion with a dissolver disc and afterwards the extremely fine grinding with an integrated basket mill can be made in one process and one container. This innovation intelligently combines proven high speed dispersion technology with a basket mill system. The powdered component is fed into the liquid phase at low speed, wetted and premixed. The premixed product is dispersed with the dissolver disc in the classical manner.The powdered component is fed into the liquid phase at low speed, wetted and premixed. The premixed product is dispersed with the dissolver disc in the classical manner. ​When the powders have been added and the pre-dispersion is complete, the milling basket is lowered into the millbase. The TORUSMILL® TM now starts the actual dispersion process for extremely fine grinding. 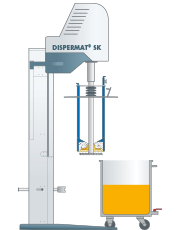 The patented dispersion system reaches excellent dispersion results and a narrow particle size distribution in a very short time. The fine grinding process is now successfully finished. Cleaning the milling system is carried out in a separate conical container in order to minimise the required amount of cleaning fluid.